AeTopus is an Electronic music project composed, arranged, and produced by artist/musician Bryan Tewell Hughes. Hughes began taking piano lessons at age 6, and immersed himself in visual arts and amateur filmmaking as a young man. His passion for science fiction and fantasy films and their soundtracks would later help set the tone for his musical pursuits. During the 1990's, Hughes played bass guitar in blues, Reggae, funk, and punk bands in the Pacific Northwest before settling into a more experimental, studio-based identity. After releasing a solo Industrial album, AnthroPile: Take in 1999, he revisited his more contemplative musical roots and embarked on AeTopus - a project that he has remained passionate about to this day. AeTopus has become recognized for its unique crossover sound - one that is too fantastic and original to be called “New Age” or “World”, yet too dynamic to be considered pure Ambient or Chillout. Bryan manages to keep his compositions active and instrumentally diverse while maintaining an insightful, mood-generating environment. Special attention to thematic progression makes his albums much more than song collections; they are subtle, flowing works of sonic art, almost essay-like in fashion and form. 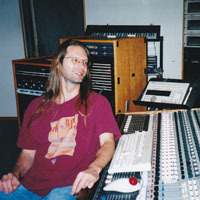 Hughes credits his grandparents for introducing him to Electronic music in the 1980's, and names Kitaro, Ray Lynch, Tangerine Dream, and Vangelis as some of his early influences. These vintage roots are deftly melded with current recording technology and an appreciation of organic and acoustic elements to produce a refined, fresh sound not heard until now. AeTopus has been compared to Berlin “active” space music, to the Mystique releases of the Narada label, and to old-school New Age electro-instrumental a la Jean-Michele Jarre and Popol Vuh. A former tattoo artist, Hughes holds degrees in Fine Arts and Psychology. He currently creates music and visual art in his Bellingham, Washington studio. 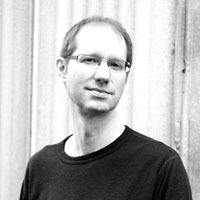 Bill Simpkins is a multifaceted musician, producer, and mixing engineer who has contributed his technical talents to AeTopus for more than a decade. 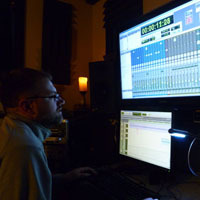 He works out of his state-of-the-art Alpenglow Sound Studios in Bellingham, Washington. 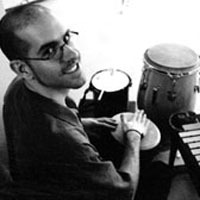 Mike Bajuk is a percussionist, composer, and music educator who performed ethnic, improvised, and drum kit percussion for the first two AeTopus albums. He has been involved in numerous jazz and rock bands in the Pacific Northwest, and is currently a senior instructor for Western Washington University’s Department of Theatre and Dance in Bellingham, Washington. 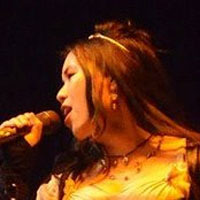 Vivian Lee is a vocalist residing in Seattle, Washington, whose voice is featured on the Angels and Machines EP (2013). She is also an actress, costumer, and reenactment personality who performs regularly with the Seattle Knights troupe. Vivian also plays violin and sings in Aeterno Elementum, a heavy metal opera staged by Seattle’s Ara’Kus Productions. Copyright 2002 - 2016 by 12Ton Productions. Photos property of respective owners.